A Happy Healthy Mummy: Pizza could help your hay fever! This pizza could save your summer! 'What you eat can affect your hay fever positively or negatively', says Max, because 'certain foods can exacerbate the symptoms of hay fever whilst others can ease them'. For example, he explains that a pizza that contains tomatoes is 'a super source of antioxidant vitamin C that researchers have found give protection against allergies and asthma', while adding yellow pepper, which contains beta carotene which is high in vitamin C and bioflavonoids, 'is said to be good for preparing your body and fighting off hay fever symptoms'. Other helpful ingredients Max cites include red onions; which contain high amounts of the natural antihistamine quercetin, pineapple; which contains bromelain that helps the body absorb quercetin and garlic, which may help to clear your nasal passages, and has natural decongestant effects and can help to reduce excess catarrh. Max says ditch the processed meats and dairy cheese, 'as they can stimulate mucus, which can build up in the throat and make your hay fever symptoms worse'. He suggests using a dairy-free ‘cheese’, such as tofu or a cashew nut-based on instead, adding 'tofu contains zinc which is antibacterial and antiviral, whilst nuts are a great source of magnesium and vitamin E. As an antioxidant, vitamin E protects the body from damaging free radicals. Free radicals can cause oxidative tissue damage, which triggers inflammation that contributes to problems like allergies and asthma'. Of course, if you have a wheat allergy you can use a gluten-free flour for the base, while using wholegrain flour for the base, or a ready-made whole grain base, is better for your hay fever because of the zinc content, as zinc is antibacterial and antiviral. Max suggests topping with rocket or baby spinach leaves for an extra zinc shot too! 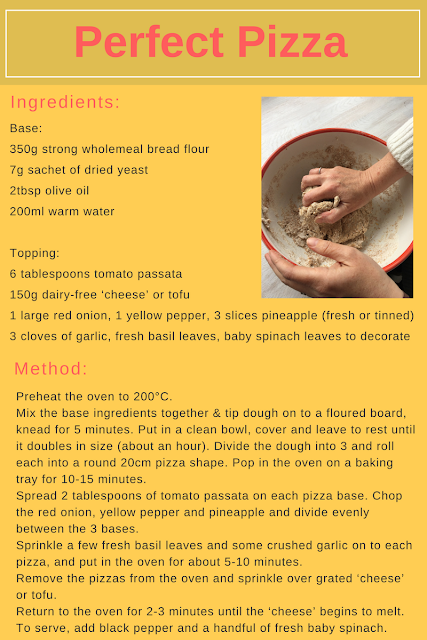 Thank yo for sharing the recipe of pita.I really likes pizza very much.Pizza is so expensive so it is better to make pizza at home.